Pilots have used a variety of study materials for decades to learn airplane system information in preparation for exams. Paper study guides bound together, note pads with scribblings everywhere, and flash cards are all cumbersome to carry while working. With the technology available in the market today, there had to be a better way to learn, maintain, and share aircraft knowledge. While sitting reserve away from home, using his iPhone to accomplish many routine tasks, inspiration struck. David Durham decided to build an iPhone App to replace all that other bulky study material and allow fellow aviators to study and share their information. After all, with years of commercial and corporate aircraft experience, how hard could it be to make an App? Chain Linked, Inc. was born and, as it turns out, building a stable App that meets Apple's standards is challenging. We relished the challenge and stuck with it. 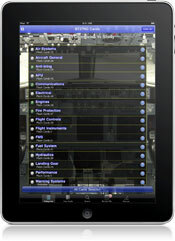 Today, these apps are used by thousands of pilots worldwide to help study, learn, and retain aircraft systems knowledge. Expanding on the idea of sharing educational information, we created iCram Master. Now teachers, students, classmates, and friends can create and share their study material with a few screen taps. Chain Linked continues to create and update Apps to help everyone retain the knowledge they desire.